I had passed by the old church on the southern edge of the town so many times on the transfer but still not yet walked out to investigate it. Thinking it would make for some spectacular photographs I wanted to capture some images before the snow began to melt. I stepped out one mid-morning after being in the office and was relishing doing something normal for a change, breaking the routine that had set in. I felt like a tourist and taking a stroll through the village on my own with no ski business to do lifted my spirits more than I was anticipating. Having walked the same streets, being confined to the same part of the village for so long, it was refreshing to explore a new area. I was ambling along the pavement by the side of the road, admiring a different view of the frozen lake and watching the tower of the church getting closer with every step, when a yellow VW Golf estate pulled up alongside and stopped just ahead of me. The tyres scrunching on the snow as the car drew to a halt. I recognised the three crowns symbol of the Swedish postal service on the doors. The window was wound down and the driver reached out an arm and pushed a bundle of letters and magazines through the opening of a mail box on a post at the road side and then drove off, the tyres spitting off tiny oblongs of snow that had got caught up in the tread. Nothing unusual in all that, but something was bugging me. Something wasn’t right, or rather it was but I couldn’t work out why it didn’t feel right. Was I over tired? And then it dawned on me – it was a right hand drive car. How very sensible and how very typically Swedish that was. The Romanesque church was called, imaginatively, Åre gamla kyrka (Åre old church) and was constructed in the 12th century. According to local history, once it was built the villagers had been encouraged to convert from their old beliefs of Norse gods and start believing in a bloke who died thousands of miles away in the Middle East before coming alive again a few days later. Remarkably, the church survived, probably due, in no small way, to a convincing marketing campaign on behalf of the Christians. The church had been formed in two structures; one a rectangular stone walled building under a pitch roof. The other was a much more ornate, smaller but taller square tower structure also of light coloured stone. At first floor, there was an elegant dark timber balcony running around all four sides under a small four pitch roof. This rose up to a pointy octagonal onion-like spire sat on top of what looked like an observation floor with tiny windows looking out on all four sides. Since the ground was permanently frozen during the winter, it was impossible to bury any villager who died during the cold months. This tower was where they kept the bodies in their coffins until the ground had thawed enough for the grave diggers to start their work. I wasn’t sure whether someone was pulling my leg but, just in case, I didn’t try to open the small wooden door to the tower to take a nose around. Instead, I busied myself with taking what I considered to be some very arty shots. When I had passed this church at night time the bright spotlights that were pointed at it made it look quite spectacular so I decided I should return that evening for another photo session. The temperature gauge outside my window read minus eighteen degrees but that did not deter me from my evening stroll. I did wonder if my camera would still be functioning twenty minutes later when I would arrive at the church so I put it deep inside an internal pocket in my jacket. As I left the warmth of the Sporthotellet, I looked up to see a wonderful dark blue cloud-free sky awash with stars. It was 9pm but the sky was no longer completely dark. Encouragingly, there was a hint of lighter evenings to come as Spring approached. The snow cover on the ground was still a reminder of the winter’s grip on the landscape, and the freezing temperature confirmed that. I cut across some open space away from the main road and negotiated my way around the back of the Hotel Åregården, finding a little used pathway that led down towards the lake, across what I presumed were the gardens of people’s houses. After five minutes, I had reached another smaller road and followed this towards the church, the treaded soles of my new boots making a pleasing crunch as they gripped the snow reassuringly. Elated again to be walking along a route I had not done over the last few months, it was good to strike out on my own, even doing something as simple as this night time stroll. I was keeping the cabin/resort fever in check. The church looked even more spectacular at night time and I was in my element as I set about taking some more artistic photographs. I was so focussed on what I was doing, I almost forgot where I was and started to think about how we had been going non-stop for almost four months pretty much every day, usually burning the candle at both ends. In any normal job, I would have had the weekend off or a couple of quiet nights in. Adrenaline had sustained me for quite some time and this simple half an hour of photography, not thinking about guest lists and where I had to be next, was a welcome relief. As I moved around the outside of the church, I suddenly felt a little dizzy. My vision of the snow seemed to go in and out of focus and a green shade of light appeared around my periphery. Was the tension and stress that had built up manifesting itself in some sort of migraine attack? As I looked at the snow, the ground started to pulse in green and now yellow waves and I felt unsteady on my feet, like the snow was moving under my boots. I straightened up and looked around for something to hold onto and, as I lifted my head, I saw the whole sky was pulsing with green and lemon waves. It was the Northern Lights, of course; a most spectacular display of energy being released in the upper layers of the atmosphere. I stood there, wide eyed and mouth open like a small child seeing Santa Claus in his sleigh flying across the sky. All feelings of weariness and tension and stress left me and I wanted to be carried up into the sky and along on those glowing waves of light. The luminous pulsating waves then began to twitch and jump like smoke billowing up from a giant sky wizard’s fire pit. I have absolutely no idea what giant sky wizards are, of course, but if they exist I’m sure the smoke from their fires would be just like this. After a few minutes, the light waves poured down the sky like a slow motion waterfall before subsiding and retreating to the horizon. And then they were gone. And so too was my opportunity to take any photos of the light show because, through all of this, I had just held on to my camera and forgotten to actually lift it up and press the button, so in awe was I of the display. What was more, I hadn’t been able to take my eyes off the sky for fear of missing one single second of it. But the images would be imprinted on my memory forever. It was a pity no one else was there to witness it with me, I thought, but then again it was like having a very private, VIP showing, if you like. I hung around for a while longer, hoping the lights would rekindle, but they didn’t and I walked back into the village feeling like I had just experienced a close encounter of a different kind. I began to wonder how many others had seen the show or, more worryingly, if when I returned to the village I would be the only person still alive. But that was just silly. The road back was unusually quiet though, I thought, and I couldn’t see any cars moving about up ahead of me. Off to the right of me, beyond the cluster of village buildings, I spotted a very bright light heading skywards. I watched it climb steadily upwards for a bit before realising it was a piste basher. As I neared the edge of the village, a ski bus went past me and I could hear Toni Braxton singing inside. All was as it should be. 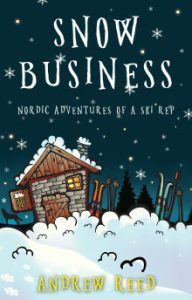 Extracted from Snow Business, an excellent account of a year as a ski rep, by Andrew Reed.